It’s a medical disorder. It is characterized by frequent pauses of breathing during sleep. Breathing stops repeatedly. It can happen dozens to hundreds of times each night. Each time ,the person stops breathing for 10 seconds or more ,then gasps suddenly for air or wakes up feeling breathless. Between each gasp or awakening and the next time breathing stops the person may snore loudly. Why should I learn about Sleep Apnoea? Because Sleep Apnoea is a serious health hazard. It can affect quality of life negatively by impaired alertness and altering mood and memory. Millions , who took Sleep Apnoea Treatment early say that they’re living stress free , energetic and fuller lives. Treated patients enjoy better health and get more out of life. Everyone’s muscles relax during sleep. This narrows the airway, but in people with OSA the airway narrows so much that it closes. As the airway is blocked , air supply to the lungs is threatened or stopped altogether resulting in reduced blood oxygen level. Because of this an OSA sufferer often wakes up when asleep but is not aware of the same. This is the most common type of Sleep Apnoea. In Central Sleep Apnoea ,the airway stays open but the brain stops telling the muscles that control breathing to work. CSA is characterized by airflow cessation due to reduced neural output from the Central Nervous System. This is the rarest type of Sleep Apnoea. This type involves both a blocked airway and a brain signal problem. For example a person may have periods of sleep apnoea mixed with periods of obstructive sleep apnoea. Even if you aren’t in any of these categories , you can have sleep apnoea. Blood tests can rule out other health conditions. 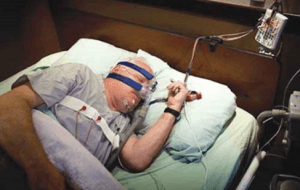 Sleep studies may be done at a sleep centre or at home using a portable equipment. It depends on the individual condition. Throat tissues are most likely to sag and block the airway in this position. In some cases throat tissues are enlarged because of too much fat, or they collapse because of pressure from a heavy neck. Losing weight can make a big difference. Smoking can swell throat tissues. This can add to throat blockage. These include alcohol and tranquilisers. They can cause people with sleep apnoea to stop breathing more often or for longer periods of time. Using a Continuous Positive Airway Pressure (CPAP) device often helps . The person uses it while sleeping. CPAP is the gold standard treatment for OSA. 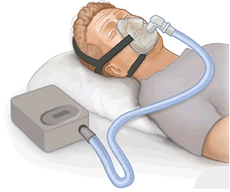 CPAP holds the upper airway open during sleep by providing pressurized air via a nasal or full face mask. Effective CPAP therapy has been shown to improve patient’s quality of life reduce the health risks associated with OSA and save on healthcare related costs. CPAP therapy significantly reduces the cardiovascular (CV) outcomes associated with OSA. It fits over the person’s nose ( or in some cases the nose or mouth) . A small bedside pump pushes a steady stream of air through the mask. This air pressure keeps the person’s airway open. When properly used CPAP is one of the most effective treatments for Obstructive and Mixed sleep apneas.It can also help in some cases of Central sleep apnoea. For many people having restful sleep is well worth the minor discomforts of using CPAP. One may need to have a sleep study with a CPAP device to find the proper air pressure. 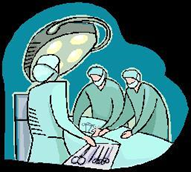 Surgery can be done to remove parts of the soft palate, tonsils or other throat tissues. This widens the airway. Surgery may also be used to correct problems with jaw position. For those with Central apnoea ,surgery may be required to correct an underlying condition. Adjusting your treatment plan if necessary. Let your doctor know whether your symptoms have gone away, become less severe or changed in any other way. Do all people who snore have sleep apnoea? No. Although many people with sleep apnoea snore, most snorers do not have sleep apnoea. Other causes of snoring may be ruled out. Will getting rid of snoring stop sleep apnoea? Not necessarily. For example, there are medical procedures and over the counter devices that can reduce snoring. These may not help with sleep apnoea. Can sleeping pills help stop sleep apnoea? No., they can make it worse. Any drug that makes you drowsy can weaken your breathing reflexes or make throat tissues sag even more. Yes. Signs may include snoring, restless sleep and behavior problems. Can sleep apnoea affect babies ? It’s common for babies to stop breathing briefly. This can be normal. What can loved ones of people with sleep apnoea do? Encourage the person to get medical attention. Go with the person and give your observations about his or her sleep. Support the person in staying with his or her treatment plan.